CSI (ColorStoriesInspiration) has always been one of my fave challenges and I really enjoyed my time as a Detective before, so I was really happy when the lovely Debbi Tehrani invited me back on the team - I feel like I'm coming home! There have been some changes since I last Cracked a Case - for one thing, there's a brilliant FaceBook page now, which is a great way to keep in touch with everything that's going on. 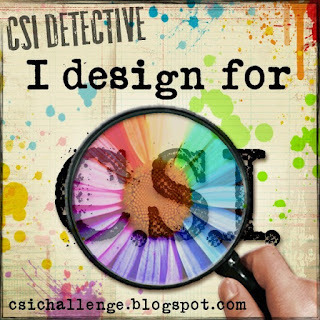 One of the most exciting changes for me is that CSI has gone "Free Style" - which means that you can still be inspired by the Case File, but you have more freedom to solve the case your own way. Thanks for popping in today, see you again soon!